Nextime Word Clock – Timekeeping For The Literate | OhGizmo! If you’re redecorating the office and are looking for a unique clock to sit on your desk, the Word Clock should fit the bill. Alternately, if you’re redecorating the bathroom and are looking for a towel rod that tells the time, the Word Clock would also be an appropriate choice. Instead of a traditional clock face with moving hands or even a digital display, the Word Clock uses a couple of rotating cylinders to tell the time in phrases. 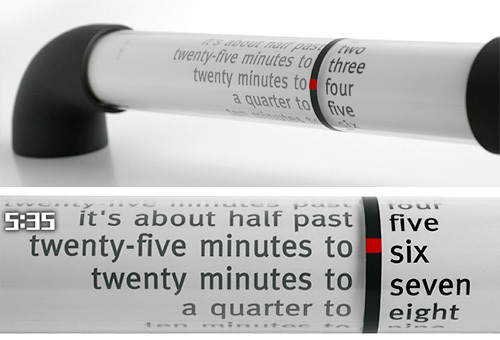 The cylinder with the hours is pretty straightforward, but the other one listing the minutes is a bit on the verbose side. Instead of just saying 2:55 for example, the clock would be read as ‘five minutes to three’ and so forth. The minute phrases are listed in 5-minute increments so the clock is fairly accurate, but I wouldn’t recommend it for timing a marathon or anything like that. The Word Clock is currently available from Amazon for $122.88. Well this is cool, but most of the folks I know would rather say “Five thirty-five” instead of “Twenty-five minutes to six” It so much more concise. I was thinking of redecorating, and I have to say, that was something I definitely did not think about. But the ideas are really nice especially when you're a time freak like I am. I just need to get rid of some of the things that have cluttered both my house and my office, and I'm looking into various boston storage units. As soon as I'm done with that, I'll take your advice. 2:55 should be Five minutes to three…not fifty five minutes to three like the description says.